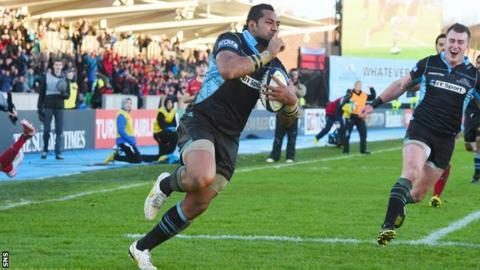 Glasgow Warriors resurrected their European Champions Cup campaign, thrashing the Scarlets with a six-try display of physical bullying and backline ruthlessness. Huge winger Taqele Naiyaravoro scored three tries, with Duncan Weir, James Malcolm and Tim Swinson also touching down for the hosts. Steve Shingler kicked the Scarlets' only points with two penalties. Wayne Pivac's Welsh side are winless from their three Pool 3 fixtures. This was a commanding, powerful display from the Warriors, but the much-needed result was all the more noteworthy given the hosts were some way from their best until the final quarter. Balls were fumbled and opportunities squandered, although the hosts never looked troubled. This vital victory was built on a physical supremacy established at the first scrummage and epitomised by the fearsome tackles of Simone Favaro, and the charges of the hulking Naiyarvoro. In the process, they consigned their set-piece obliteration by Northampton Saints in their last European outing to memory. Eschewing an early shot at goal, Weir kicked a penalty to touch, the forwards splintered the Scarlets eight and the squat little pivot darted through a gap in the visiting defence to slide in and open the scoring, converting his own try. Shingler responded with three points from the tee, but Scarlets were pinned back by punishing carries from Adam Ashe, Jonny Gray and Naiyaravoro, who even managed to make roadkill of Welsh tight-head Rhodri Jones. Utterly dominant, Glasgow should have claimed more for their supremacy. First, Stuart Hogg failed to hold an awful interception pass from Shingler barely five metres from the Scarlets line. Then came a truly awesome display of power from the giant Naiyaravoro, who showed dexterity to pluck a clearing kick from the air as it plummeted towards touch then laid waste to the pack of chasing defenders who stood between him and the try-line. It was a stirring spectacle, but the big man's toes were adjudged to have grazed the touchline by the TMO. Their fixture last weekend against Leinster fell victim to the biblical Glasgow downpour and, at crucial moments in the first half, things just weren't quite clicking for the Warriors. They made do with a Weir penalty on the stroke of half-time. Michael Tagicakibau sparked Scarlets' best period of the match just after the break with a brilliant burst down the left, culminating in a second penalty for Shingler. But Glasgow would quickly reassert their control, 21-year-old Malcolm burrowing over, Weir converting again. Now the hosts smelled blood and produced some of their most incisive offloading fare. Naiyaravoro rumbled down the right touchline - dispatching only three Scarlets defenders on this occasion - and scored a deserved try. Finn Russell, on for Weir, was accurate from the tee and Hogg did well to hold Jack Condy up over the line when Scarlets did manage to exert some pressure. Russell added a delightful touch of finesse to a game peppered with brawn, floating a crossfield kick into the considerable grasp of Naiyaravoro, who sauntered in for the bonus-point score. Russell converted and Naiyaravoro wasn't done there, infiltrating the Scarlets backline to intercept a stray pass and canter home for a hat-trick that has further cemented his burgeoning status as Scotstoun's latest cult hero. Though the conversion sailed wide, the Russell-Naiyaravoro axis almost bore fruit again after the fly-half sent the man-mountain thundering after another diagonal punt, the ball just beating him to the touchline. Swinson had the final say in the eventual rout, Russell converting, leaving the Scarlets with scant hope of progressing in the tournament, and sating the Glasgow supporters who have long been awaiting such a rousing European triumph. Scarlets head coach Wayne Pivac told BBC Wales: "Up until the 50-minute mark we were in the game at 10-6 and then had an opportunity at 17-6 which we didn't finish off. "But that last half-hour we fell off too many tackles and they put us away good and proper. "Naiyaravoro is a big man isn't he? Very hard to tackle and a big man with a bit of room to move is very hard to stop so that's something we've got to work out within the next seven days, how to do that." Glasgow Warriors: Hogg, Naiyaravoro, Dunbar, Horne, Seymour, Weir, Blair, Grant, Malcolm, Puafisi, Nakawara, Gray (capt), Strauss, Favaro, Ashe. Replacements: Mamukashvili, Yanayanutawa, Fagerson, Swinson, Harley, Hart, Russell, Lamont. Scarlets: Steff Evans, Harry Robinson, Regan King, Gareth Owen, Michael Tagicakibau; Steve Shingler, Gareth Davies; Phil John, Emyr Phillips (capty), Rhodri Jones, George Earle, Tom Price, Lewis Rawlins, Tom Phillips, Morgan Allen. Replacements: Kirby Myhill, Dylan Evans, Samson Lee, Maselino Paulino, Jack Condy, Rhodri Williams, Aled Thomas, Michael Collins.